Like many do-it-yourselfers, my house was built around the time of the dinosaurs and much of the equipment was so antiquated that replacement was a matter of necessity. I noticed that my thermostat, a non-digital dial type that I am pretty sure was installed my Thomas Edison, wasn't quite working up to snuff. It was time to replace it, and while I was no expert at electrical wiring, I was determined and dedicated. As the temperatures begin to fluctuate and winter turns to spring you may be thinking of replacing an old thermostat too. I want to make sure that everyone understands that this is for an furnace and A/C unit and not a heat pump system. A heat pump system is wired a little differently. Before you do anything at all, go out to your breaker box and shut down the electricity to the thermostat. You're dealing with live wires and explaining to an ER nurse that you nearly electrocuted yourself putting in a thermostat is a humiliating endeavor... trust me. Also, since your furnace/AC is going to be out for a while, I would suggest doing this job in the spring or summer. While I am sure nothing will go wrong, I find it best to never tempt fate. Temperatures can drop fast in the dead of winter. 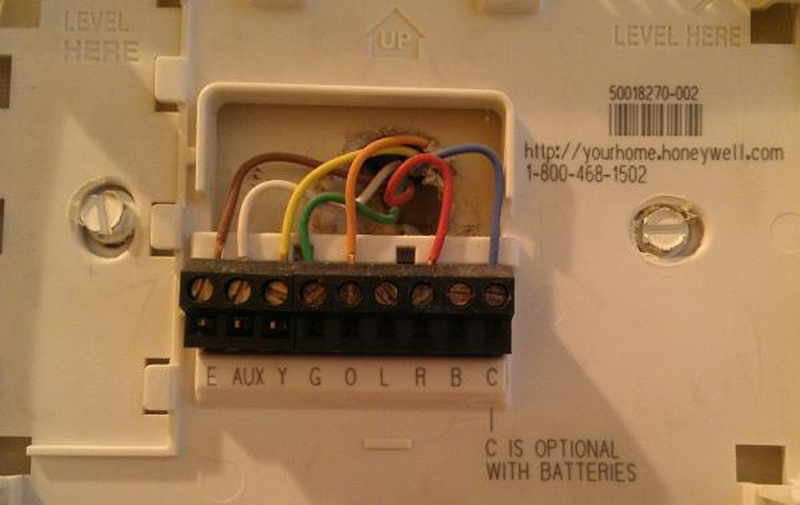 Most thermostats have a wall plate that can be removed usually by sliding it up. This exposes the screws. Remove these and take the unit off the wall. Be careful when removing the thermostat from the wall. The wires are still connected and that last thing you want to do is accidentally rip them out. While they are still connected, label exactly where each wire goes. It's generally accepted that color coding for the wires is universal, but that's not always the case. It's true if the person who installed the original unit was a contractor, but if you don't know, then it's best to trust your instincts and simply label the wires. A standard HVAC system will have terminals for the 24 Vac common (black), 24 Vac transformer, (red) 24 Vac for heat (red), 24 Vac for cool (red), switched power for heating(white) and cooling (yellow) and finally the switched power to fan (green). These should be marked on the back of the thermostat. Remove the wires carefully and tape each one to the wall. Why? I learned the hard way that the wires can fall back into the wall and then good luck fishing them out. Rather than deal with that headache, simply tape them to the wall and that way they can't move. First, screw in the wall plate in the same area as the last one. The size and shape may be a little different, so you may need to drill new holes. If you end up drilling new holes, then make sure they are level. A cockeyed thermostat screams amateur to anyone that comes into your home. While the various makes and models are all different, how they are wired are generally the same. Since you have each wire taped and labeled, it's simply a matter of matching them up to the right terminal. One by one, connect the wires to their proper terminals using the labels you made earlier. Make sure each one is fastened securely. You're going to be putting the wiring back into the wall and sometimes that can loosen a improperly fastened wire. With the wires connected, attach the new thermostat to the wall mount and turn on the electricity. Check to make sure each function is working properly. If not, then likely a wire has come loose or is connected to the wrong terminal. Congratulation, another do-it-yourself project is on the books.